A man who had a leg amputated after being shot during political unrest in 2004 recently came to an emergency clinic for earthquake victims in Haiti’s capital Port-au-Prince, hoping to get help. Many people with physical disabilities pre-dating the 12 January 2010 earthquake are identifying themselves as direct quake victims so they can access services, according to Kate Gerry, physical therapist with Handicap International (HI). “He is on a waiting list,” Gerry said of the gunshot-wound amputee. “He is someone who would benefit a lot from prosthesis; we can’t just turn him away.” HI’s current official remit, however, is to help quake victims only. Assistance to Haitians wounded and disabled by the quake has underscored the challenges of carrying out an aid response in a country where pressing socio-economic problems existed long before the quake. Some 60 percent of Haitians lack access to basic healthcare services, according to the UN Children’s Fund (UNICEF). But most aid funding is strictly for quake response. “You need to keep the priorities as [the donors are setting out],” Faiz Rahman, HI prosthetics and orthotics project manager, told IRIN. He acknowledged there is “frustration” among people who are disabled but were not directly affected by the earthquake. Local NGO J’aime Haiti estimates that just 5 percent of disabled Haitians had access to health and social services pre-earthquake. Haiti ranks 149 out of 182 countries in the UN’s latest Human Development Index. A paper by Active Learning Network for Accountability and Performance in Humanitarian Action (ALNAP) sets out the context of the quake response, noting that most Haitians survive in the informal sector, with no guarantee of income or access to capital. The earthquake added 3,000 to 4,000 amputees to Haiti’s disabled population of about 800,000 (out of a population of 10 million), according to the Haitian secretariat for the integration of disabled people. It also destroyed most facilities dedicated to services for the disabled community. 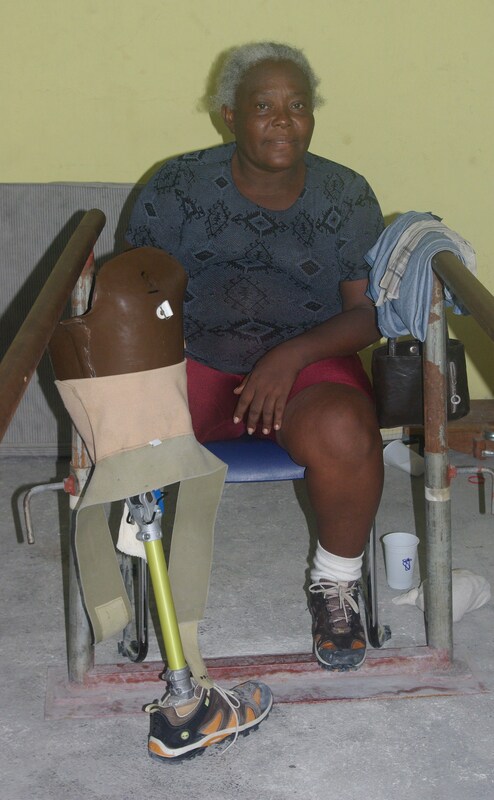 HI has its main clinic in Port-au-Prince where earthquake survivors can be fitted with prostheses and orthoses, and can get physical therapy and psychosocial support. HI also has people stationed in camps for displaced people - in Port-au-Prince, Petit-Goave and Gonaives - to facilitate access to services. Given the level of destruction, mobile clinics and accessible services are essential, HI says. “The thing we can’t simulate here [at the clinic] is that when you go into the community… some people are living in tents on steep hills with rubble all around,” said HI’s Gerry, adding that disabled people not only have to adjust to a new prosthetic limb, but also have to learn to navigate Port-au-Prince’s chaotic traffic and rubble-strewn streets. The disaster worsened conditions for the disabled but at the same time brought international attention to the disabled community’s situation, said Gerard Oriol, founder of J’aime Haiti. The attention on Haiti is a chance to highlight how stigma attached to physical disability has long hampered disabled people’s development, he said. Oriol sees the earthquake as opening a door to better services, which he said had already begun to improve in recent years with the 2006 creation of the secretariat for the integration of disabled people, and laws affirming the rights of people with disabilities.